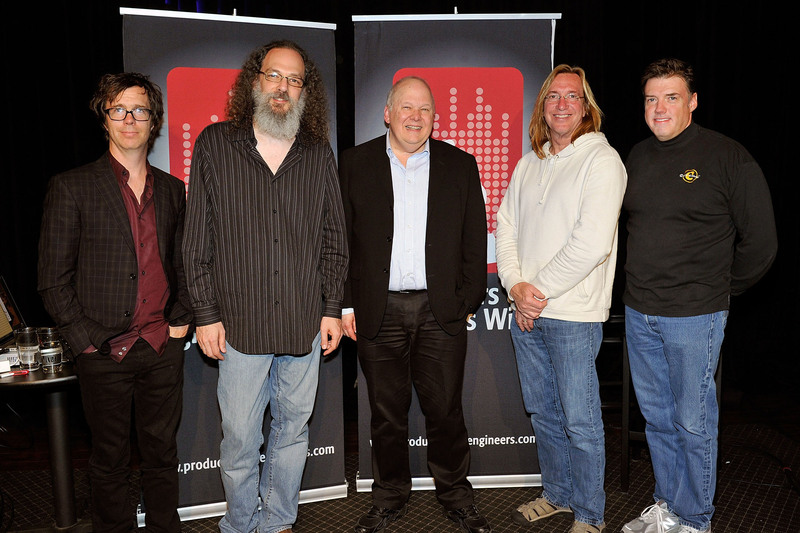 Pictured L-R: Ben Folds, Andrew Scheps, Bob Ludwig, Chuck Ainlay, and Frank Liddell attend the "Quality Sound Matters" event in Nashville, TN, on April 25, 2013, presented by The Recording Academy® Nashville Chapter, in partnership with The Producers & Engineers Wing®. Photo by Frederick Breedon/WireImage.com. Photo courtesy of The Recording Academy®/WireImage.com. © 2013. 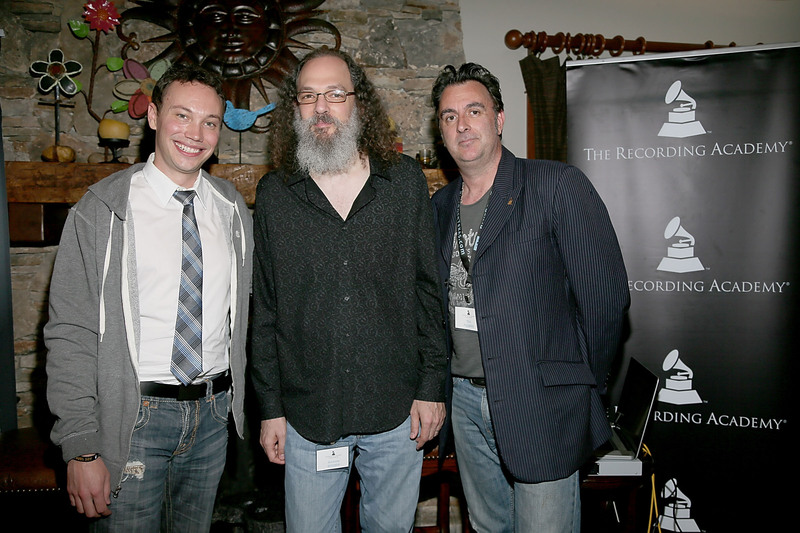 Andrew Scheps attends the "Quality Sound Matters" event in Nashville, TN, on April 25, 2013, presented by The Recording Academy® Nashville Chapter, in partnership with The Producers & Engineers Wing®. Photo by Frederick Breedon/WireImage.com. Photo courtesy of The Recording Academy®/WireImage.com. © 2013. Pictured L-R: Eric Boulanger, Andrew Scheps and Tim Palmer pose on stage during the P&E Wing Texas Retreat At The Rock at Blue Rock Studios on April 27, 2013 in Wimberley, TX. Photo by Gary Miller/WireImage.com. Photo courtesy of The Recording Academy®/WireImage.com. © 2013. Pictured L-R: The Recording Academy® Member Services Production Manager Reid Wick, Esplanade Studios owner Misha Kachkachishvili, recording engineer Chris Finney, Recording Academy Memphis Chapter Senior Executive Director Jon Hornyak, Memphis Chapter President Susan Marshall, recording engineer/mixer Andrew Scheps and PMC's Maurice Patist attend "Lost In Translation with Andrew Scheps" at Esplanade Studios on May 1, 2013, in New Orleans, LA. Photo by Erika Goldring/WireImage.com. Photo courtesy of The Recording Academy®/WireImage.com. © 2013. SANTA MONICA, Calif. (June 3, 2013) — As part of the ongoing "Quality Sound Matters" initiative, which educates about and demonstrates the importance of high-quality audio, The Recording Academy® Nashville, Texas and Memphis Chapters, together with the Producers & Engineers Wing®, recently presented a series of three events that featured a presentation by GRAMMY®-winning engineer Andrew Scheps along with conversations with locally based luminaries. 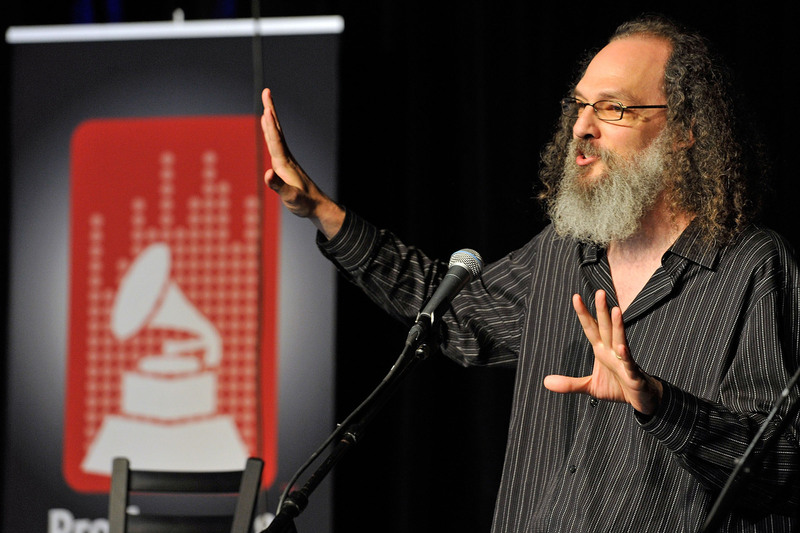 In Nashville on April 25, Wimberley, Texas, on April 27, and New Orleans on May 1, the events known as "Lost In Translation" with Andrew Scheps provided an engaging, revelatory and humorous presentation of current audio format comparisons. Set in high-end listening environments, the demonstrations showcased the auditory differences of master recordings played back in different formats such as vinyl, CD, MP3, AAC and online streaming models. Scheps has engineered and mixed for some of the biggest acts in the business, including Adele, Metallica, Red Hot Chili Peppers, Linkin Park, Green Day and U2. He is a two-time GRAMMY winner for his work on the Red Hot Chili Peppers' Stadium Arcadium and Adele's 21 albums and was named the 2012 International Engineer of the Year by the UK’s Music Producers Guild. In Nashville and Texas, "Lost In Translation" was part of a larger presentation. In Nashville the overall event was titled "Quality Sound Matters" and focused on the importance of capturing authentic performances that sonically reflect the artist's intent. Scheps' "Lost in Translation" presentation was followed by a panel discussion including moderator Chuck Ainlay (GRAMMY-winning producer/engineer; Dire Straits, Emmylou Harris, Taylor Swift, Miranda Lambert and many more) and panelists Ben Folds (singer/songwriter/composer/TV personality and owner of "Ben's Studio," formerly Nashville's legendary RCA Studio A), Frank Liddell (producer/publisher; Lee Ann Womack, Miranda Lambert, Eli Young Band) and Bob Ludwig (GRAMMY-winning Mastering Engineer; Led Zeppelin, Daft Punk, Rolling Stones, Green Day and many more), as well as Scheps. The Texas event, known as "Texas Retreat at the Rock," was held at the picturesque Blue Rock Studios. Additional presentations were also part of these sessions, featuring mastering engineer Eric Boulanger of The Mastering Lab in Ojai, CA, and Boulanger and Scheps in a panel moderated by platinum producer/engineer Tim Palmer. Boulanger has mixed and/or mastered records across a variety of genres with credits including Colbie Caillat, The Bravery, Kate Bush, and Chris Botti. With the P&E Wing, Eric has taken a lead role in Apple’s "Mastered for iTunes" project, which aims to improve the quality of current and future downloaded music. Palmer is a GRAMMY nominee for his work on U2's All That You Can’t Leave Behind, and he has produced artists such as David Bowie, Robert Plant, Switchfoot and Tears for Fears, written songs with Ozzy Osbourne and the Goo Goo Dolls, and mixed albums for artists including Pearl Jam and The Cure. Maureen Droney, P&E Wing Senior Executive Vice President, stated, "'Lost in Translation' is an entertaining yet simple and practical exploration of the various formats delivering music to consumers today. Our 'Quality Sound Matters' initiative and related projects are helping provide the knowledge base for a new and developing era, so engineers, producers, artists and home listeners alike can have informed ears in regards to audio quality. We thank Andrew and all of our P&E Wing luminaries for helping us explore these concepts and educate minds and ears around the country with these recent events." Photo Caption 1: Pictured L-R: Ben Folds, Andrew Scheps, Bob Ludwig, Chuck Ainlay, and Frank Liddell attend the "Quality Sound Matters" event in Nashville, TN, on April 25, 2013, presented by The Recording Academy® Nashville Chapter, in partnership with The Producers & Engineers Wing®. Photo by Frederick Breedon/WireImage.com. Photo courtesy of The Recording Academy®/WireImage.com. © 2013. 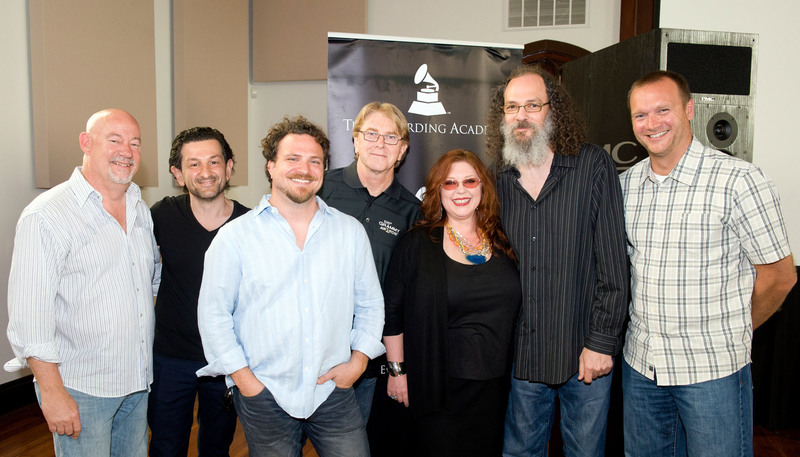 Photo Caption 2: Andrew Scheps attends the "Quality Sound Matters" event in Nashville, TN, on April 25, 2013, presented by The Recording Academy® Nashville Chapter, in partnership with The Producers & Engineers Wing®. Photo by Frederick Breedon/WireImage.com. Photo courtesy of The Recording Academy®/WireImage.com. © 2013. Photo Caption 3: Pictured L-R: Eric Boulanger, Andrew Scheps and Tim Palmer pose on stage during the P&E Wing Texas Retreat At The Rock at Blue Rock Studios on April 27, 2013 in Wimberley, TX. Photo by Gary Miller/WireImage.com. Photo courtesy of The Recording Academy®/WireImage.com. © 2013. Photo Caption 4: Pictured L-R: The Recording Academy® Member Services Production Manager Reid Wick, Esplanade Studios owner Misha Kachkachishvili, recording engineer Chris Finney, Recording Academy Memphis Chapter Senior Executive Director Jon Hornyak, Memphis Chapter President Susan Marshall, recording engineer/mixer Andrew Scheps and PMC's Maurice Patist attend "Lost In Translation with Andrew Scheps" at Esplanade Studios on May 1, 2013, in New Orleans, LA. Photo by Erika Goldring/WireImage.com. Photo courtesy of The Recording Academy®/WireImage.com. © 2013. Established in 1957, The Recording Academy is an organization of musicians, producers, engineers and recording professionals that is dedicated to improving the cultural condition and quality of life for music and its makers. Internationally known for the GRAMMY Awards — the preeminent peer-recognized award for musical excellence and the most credible brand in music — The Recording Academy is responsible for groundbreaking professional development, cultural enrichment, advocacy, education and human services programs. The Academy continues to focus on its mission of recognizing musical excellence, advocating for the well-being of music makers and ensuring music remains an indelible part of our culture. For breaking news and exclusive content, follow @TheGRAMMYs on Twitter, like "The GRAMMYs" on Facebook, and join The GRAMMYs' social communities on Foursquare, GetGlue, Google +, Instagram, Pinterest, Tumblr, and YouTube.